I came across a passage that reads: "Perhaps only the elderly recall the legends of love that blossomed on the shores of the Sebeto." I asked an elderly friend (95 years old) here in Naples what he knew about (1) legends of love and (2) the Sebeto river, which used to flow through the eastern part of Naples, well outside the ancient walls, and into the sea. He said: "That's the same line I heard when I was young. 'Only the elderly recall the Sebeto.' I don't know a thing about it." References, classical and recent, to the Sebeto are plentiful. Among other things, there is a Greek coin minted in Naples in the 4th century BC wih the head of the young river-god with his name, "Sepeithos". And Virgil mentions in book 7 of the Aeneid a river he calls Sebthide. In Dryden’s English translation, it comes out as ‘Semethis’. Some references are confused. 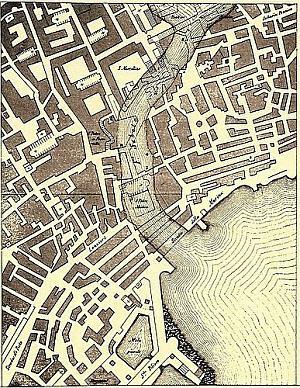 There used to be an anonymous smaller waterway that ran west along the north side of the old city walls (now via Foria), then turned south and flowed outside the western Greek wall into the sea. Obviously, since there is a major road along the old river bed now, the river is now completely dry, but as recently as the 15th century it was at times so swollen by intense rain run-off from the surrounding hills that it overflowed into the Vergini part of the city and washed away buildings. (The only name for that stream that has come down to us is the popular name Arenaccia, a pejorative for arena [sand]. That’s the reason there is an Arenaccia section of Naples: place of the dirty, rotten, lousy sand!) In any event, that was not the Sebeto. The real Sebeto is certain to have been three-quarters of a mile or so to the east; that is, outside the opposing (eastern) city wall. Medieval references are many. One of them is strange: Boccaccio once claimed the he had lived in Naples a while and had not seen hide nor hair [he may have used a different metaphor] of the famous Sebeto river. What can I say? Maybe he was too busy chasing after Fiammetta to find what must have been even in the 14th century, if not a prominent, at least a noticeable feature in Naples—a flowing river. A century later, Jacopo Sannazzaro (1458-1539), called the river "my Neapolitan Tiber". Other medieval references include Giovanni Pontano (1426-1503), who spoke of the placid waters of the Sebeto, and Veronica Gambara (1485-1550), one of Italy's first women poets of distinction, wrote, "Là dove or d'erbe adorna ambe le sponde/il bel Sebeto..." ("There where green adorns the banks of the beautiful Sebeto"). The Sebeto had a bridge at various times through the centuries, most notably one built by Robert Guiscard in the 11th century and then another, at about the same spot, under the Spanish in 1527, at which time it acquired the name, the Magdalene Bridge. In 1747, Charles III of Bourbon had the bridge rebuilt and lowered to allow for easier coach traffic. There are a few bucolic paintings of the bridge and river from the mid and late 1700s, but by 1799, a Russian officer in service of the Bourbons as they retook the Neapolitan Republic from revolutionaries, could remark that the bridge was much too long for the trickle that flowed beneath it. Centuries of canalization, agriculture and civilization had dried up most of it and now, two centuries later, all but an underground trickle in eastern Naples has disappeared. At least there is an underground trickle according to studies of the construction of new stations for the Circumvesuviana train-line in the extreme eastern end of the city; there is leakage into some of the construction sites. Reliable hydrology has traced the stream to a source on the slopes of Mt. Somma/Vesuvius, near Nola. The name "Sebeto" lingers, however: There are hydrologic reports on the "Sebeto depression," a Sebeto literary prize, Sebeto internet addresses, at least one Sebeto street in Naples, a Sebeto theater, a 1989 book called The Mysterious Sebeto, plans to build a green urban park along what used to be the banks of what used to be the river, and, of course, the large, marvelous fountain (photo at top of this entry) dedicated to the Sebeto at the Mergellina harbor. It was built by Cosimo Fanzago in 1635. Sadly, the last elderly person to recall the legends of love that blossomed on the green banks of the Sebeto must have passed away in the early 1800s. *The accompanying map (above) shows a reconstruction of the presumed flow of the ancient Sebeto into the sea. It is from Storia dei monumenti di Napoli e degli architetti che li edificavano dal 1801 al 1851 [History of the monuments of Naples and the architects who built them, from 1801 to 1851] by C.N. Sasso (reprint 1992, ed. La Botteguccia, Naples). The map shows the river coursing through the historic center of the city (that is, the area bounded by the Greek walls) and entering the sea just to the east of the church of S. Maria di Portosalvo. If it is accurate, it can only be the flow of the river before it changed course to the west (to the left in this map) at some point in prehistoric times since the Magdalene bridge (now a road) over the Sebeto is a few hundred yards to the east of this reconstructed mouth of the river.